Sizes: Subject to nearest machine settings. Please suggest required size and we will supply nearest quotations. Printing: 1 colour up to 4 colours, process colours are better printed onto white paper. The internal paper handles on this carrier bag are fixed internally and shipped within the bag. The handles are then pulled out as required. This allows for the carton size to be smaller and allows a minor reduction in shipping costs within the quoted price. Similar styles of this bag can be produced with external tape handles (usually cheaper) or twisted paper handles (fixed internally). These bags are an ideal solution as they are 100% degradeable and produced from green sources. Our Company supply printed recycled paper bags. 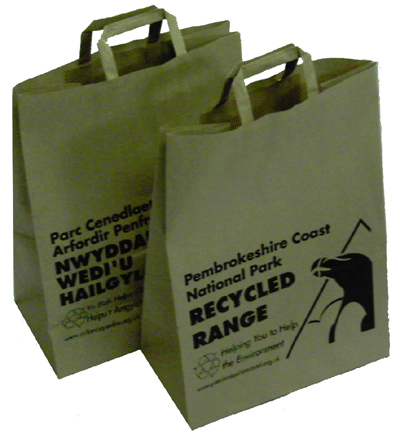 Our fine staff have helped many businesses purchase tailored recycled paper bags. To discuss choose by material or other , get in touch with Beckdale via phone or email.